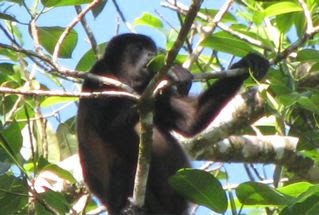 Howler Monkeys (Alouatta palliata) are found in tropical Central and South America. They are aptly named for their incredibly loud calls. Howlers are black except for the patch of color on their sides which gives them their "mantled" name. Most troops have 10-20 individuals. Like other Costa Rica monkeys they are arboreal, rarely coming to the ground, spending much of their time at the upper branches of the forest. When the males let loose their lungs in concert, generally at dawn or dusk, they can be heard up to three miles away. They are not only the loudest monkey, but the loudest land animal. The only animal louder is the Blue Whale. William Henry Hudson pointed out in his novel, "Green Mansions," that "howler" is a misnomer since the male's voice sounds rather like a powerful roar; female vocalizations sound like a pig's grunt. Most assuredly my first morning in the rainforest they were in a nearby tree when they woke me with their calls before 5 AM. My first thought was: Lion! They have very specialized vocal chambers that turn up the volume which announces to any other approaching troop that this territory is already occupied for the moment. 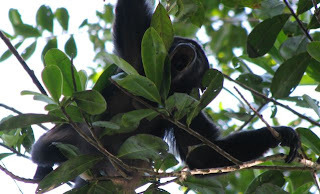 Most monkeys stay on the move to find food, but since the Howlers diet consists of 61 percent leaves, they will stay in an area and browse for days, thereby needing to defend their dining tables that tend to be at the top canopy of the forest. The rest of their diet consists of fruits, flowers, nuts and buds. Variety is important because certain species of mature leaves must be limited, as some contain toxins that can poison them. Howlers survive in the wild for up to 20 years. This is an endangered species. Howlers grow to be from 2-4 feet tall and can weigh 8-22 pounds. They are the largest of all New World monkeys and have a prehensile tail, which means it can be used as an extra arm to grip or hang, being very helpful since they rarely descend to the ground. They very seldom leave the trees. They rest about 80 percent of the time and are considered the least active of all monkeys. They have a life span of 15-20 years and live in groups of about 18 which will generally include one male for every four females. Females tend to have one baby at a time. They are threatened by hunting and also by predators such as large birds of prey. The Mantled Howler Monkey is not taken for the pet trade since their disposition doesn't do well in captivity. Populations of these monkeys are declining due to a loss of habitat. It's sure been a wonderful thing to be able to see them here at La Selva Reserve. 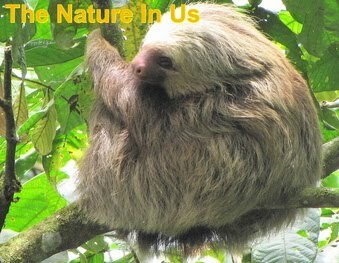 View La Selva photo ablums and more. The Howler Monkey's have a pretty strong tail! A really cool thing about their tail is that it has a fingerprint on the underside of its tip (the last part of the tail there is only skin, not fur). Each tail has a unique pattern of fingerprint! are the whole mantled howler monkeys species endangered? Yes, the species is endangered. 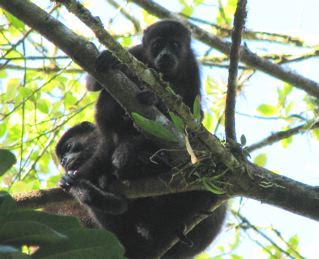 The mantled howler monkey and the black howler monkey are endangered throughout much of their range due to hunting and habitat destruction. 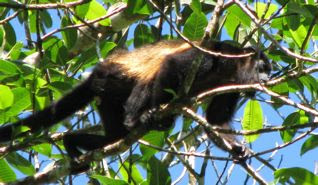 As forests are cleared, howlers, who need several acres of forest per troop to survive, are becoming increasingly rare. Throughout the region in which they are found, howlers are hunted both for food and for sport. Some experts believe that howlers could become extinct within the next 35 years.